Southern Spit Roast & BBQ Catering offers you a number of catering options, and tailor-made menus to suit your needs and budget. You can choose from the traditional spit roast menu, BBQ's, finger-food buffets, wedding catering and delicious desserts. We also provide a delivery service and offer discounted menus for those on a lesser budget such as the express option. Whether you are looking for onsite spit roast catering, offsite spit roast catering or delivered spit roast catering, Southern Spit Roast and BBQ Catering's professional spit roast catering services will make your function, party or wedding a long lasting pleasant memory for you and your guests! 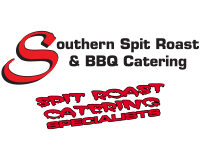 The Southern Spit Roast and BBQ Catering spit roast specialists will prepare and serve your food, you will be amazed how easy we make organising your event. "Our team are professional spit roast specialists and we give you our 100% satisfaction guarantee that you will be impressed with our very high standard of quality, quantity and service." Spit Roasts - Barbeques - Finger Food - Wedding Catering - On Site Trade Fairs - Corporate Events - Birthdays. We welcome your enquiries and would love to see you at our premises for an introduction to discuss all your spit roast catering needs! Once we cater for you, you will wonder why you had not used us before. You'll love it all! Our spit roasted meats have the bone left in which adds amazing taste and we make our own salads with fresh ingredients by our own chefs.